A “Vote Yes” sign sits across the street from Smith Elementary School on North Liberty Street in Delaware. If the bond issue and tax levy pass, Smith would gain additional parking for staff and more playground space for students. Delaware City Schools Superintendent Paul Craft speaks to members of the Delaware community Wednesday evening about the upcoming bond issue and tax levy. Craft said the ballot items would allow the district to expand to accommodate growth without increasing taxes. 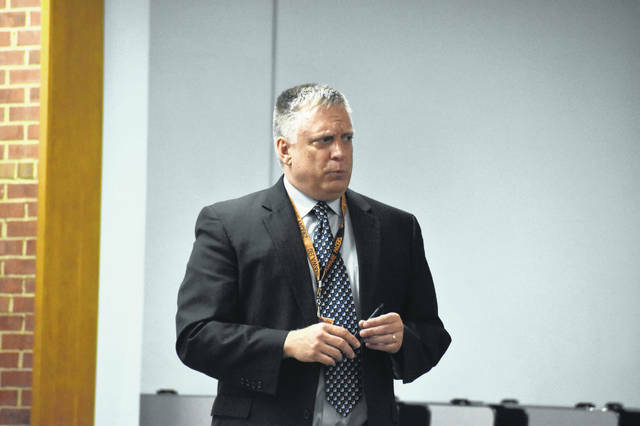 Delaware City Schools Superintendent Paul Craft gave a presentation to community members Wednesday about the upcoming permanent improvement levy renewal and a no-new-millage bond levy, both appearing on the May ballot. He reiterated there would be no tax increase if the issues pass. In January, the Delaware City Schools Board of Education voted to place the issues on the ballot for Delaware voters this May, and Craft said Wednesday he has been doing presentations in the city since then to explain the issues. The first item on the ballot is a permanent improvement levy, which deals specifically with things like school buses, building maintenance, technology infrastructure and textbooks, Craft said. It was originally passed in 1989 and has been renewed or replaced five times in the last 30 years to account for inflation. Craft said the second ballot item is a no-new-millage bond levy, which he explained will generate $36.5 million for the district to do additions and modifications to buildings in the district to account for growth without going to voters for additional funds. When the board approved the levy, Craft said the additions and improvements are still being planned and discussed, but they could include an addition to the front of Carlisle Elementary to create a more secure entrance; a small addition at Conger Elementary to account for future enrollments from developments like The Ravines at Olentangy or Terra Alta; a substantial improvement to the playground at Smith Elementary; an increase in preschool classrooms at Woodward Elementary School; renovation or replacement of the tech center at Dempsey Middle School; and renovations like finishes and cabinetry to the 2000 academic wing at Hayes High School, as well as an additional student seating area at the stadium. Craft said the improvements and renovations will also include safety film and upgraded communications equipment. He added the district is aiming to ensure all the buildings have capacity for students through at least 2027. While Craft said the district would like to go several more years without a tax increase, he added that depends on if the state legislature funds Delaware according to the state formula, or if it leaves the gain caps in place, which currently causes the district to lose out on millions of dollars in state funding. Craft said that the district has about 6,000 students, but it is funded as if it only had 4,000 students. Several members of the community attended the event Wednesday and asked Craft specific questions about the issues, including what would happen if the issues fail in May. 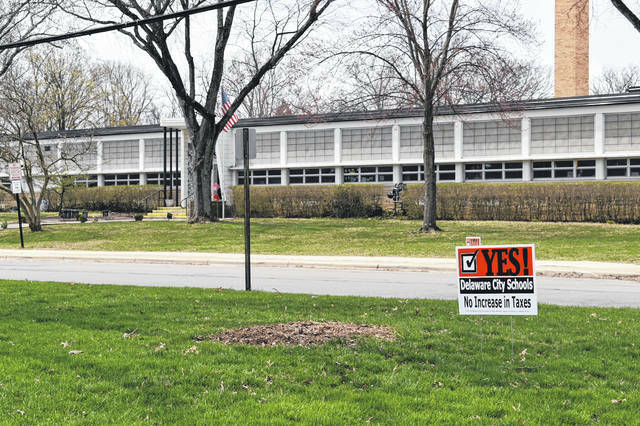 The bond issue and tax levy will be on the May 7 ballot.